1) Add 1 tbsp sugar into the warm water sprinkle the yeast and whisk, then set it aside until its foamy. 2) Pre heat the oven 350 F. In a standmixer or hand mixer beat in the eggs. Add the sugar (don't not stop the mixer just set it at the lowest sitting)melted butter, yeast mixture, oil. While the mixture is mixing combine all dry ingredients. Flour, baking soda, baking powder, salt. Then lastly add it to the wet mixture. 3) Divide the batter into 2 parts add the food and the ube in the other half leave the other half plain. 4) Scoop out the batter and drop it into the prepared baking pan (I used small ice scream scooper) leaving 2 inch space in between. 5) bake it at preheated oven 350 F for about 12 minutes. Then transfer it into the cooling rack and let it cool completely. 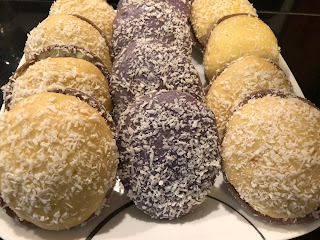 6) Take 1tsp of star margarine and spread it at the back of the cookie then take another one and attach it ( its like making a sandwich) then roll it into the desiccated coconut.